Volunteers are the backbone that supports the Forest Park Conservancy's efforts to protect the ecological health of Forest Park and ensure the park's extensive trails network is accessible, safe, and fun! Volunteers work with the Forest Park Conservancy in a variety of ways to help the park, from surveying trails, to helping out in the office, to joining one of our many volunteer work parties. Do you love Forest Park as much as we do? Join us! There are so many ways to help out, give back, and meet new friends. Learn about the fun opportunities to help out and find one (or more) activities below that suits you! These are the "bread and butter" of our volunteer efforts. Volunteer work parties are held every Thursday and once a month on Saturday at various locations throughout the park. These enjoyable events are a great way to meet other Forest Park enthusiasts, learn about Forest Park, and give back! Many of the work sites can be reached by bike and public transit as well! Our projects run the gamut of activities from pulling ivy to building rock retaining walls to raking the trails. If you have a work or social group that wants to volunteer together, we do that as well! Check out our calendar (Click here to view) to get connected with upcoming events! Our shiny new volunteer opportunity is quite different! Who would think you could help out at a local pub and support Forest Park? 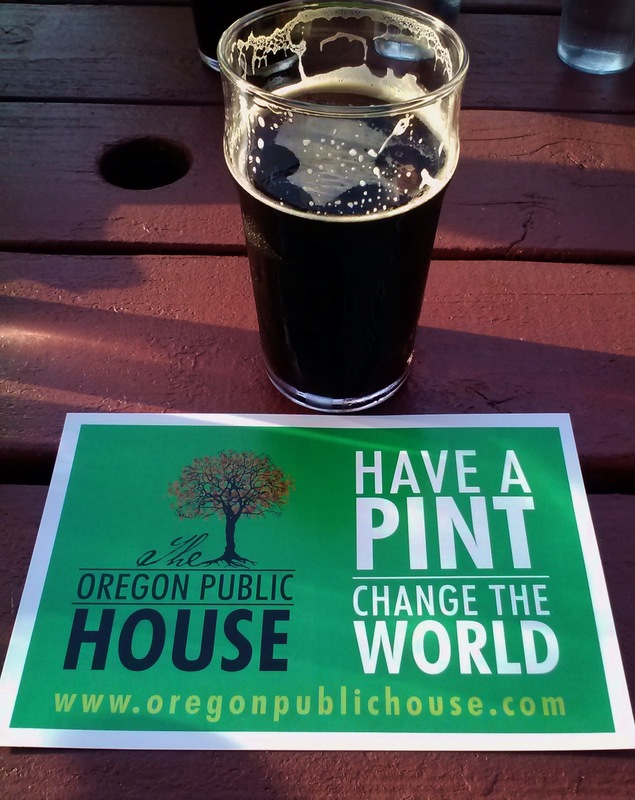 The Oregon Public House (OPH) is a nonprofit brewpub in northeast Portland that raises money for other local nonprofit causes. FPC has been selected as one of the recipients for donations, which is awesome! Volunteers help out in the pub which cuts their costs and helps them raise more money! This is a super-fun volunteer option - you get to meet lots of great folks, spread the word about FPC, stay out of the rain, and on top of all that, you get a free meal and a drink when you volunteer! Head to our OPH page to learn more by clicking here. This is another great way to help out if working in the elements isn't your idea of a good time. FPC loves to welcome volunteers to help in the office! Office volunteers help with a variety of tasks. No special training is needed, but if you have experience with data entry or similar skills, let us know! Send an email to guy@forestparkconservancy.org if you are interested. If you are one of those people who habitually clears branches from the trail as you hike, or just want to be part of the effort to keep our trails in good shape, then the Rapid Response Team may be for you! Rapid Responders are our eyes and ears on the trails, helping survey routes throughout the park after big storms. After major storms, we send out a "call to action" and volunteer responders head out to survey their trail section, performing light trail clearing as needed, and notifying our staff of any major damage or downed trees on the trails. We will provide all of the training and orientation you need. Send an email to guy@forestparkconservancy.org if you are interested. The Forest Park Conservancy works with nearly 1,000 volunteers each year. Our Volunteer Crew Leaders are essential in helping us coordinate that many volunteer projects in the park. Volunteer Crew Leaders help us lead volunteer efforts at small and large events throughout the year, allowing us to meet our goals for restoring Forest Park. These leaders go through a one-day training and sign up for at least 3 events each year. Becoming a Volunteer Crew Leader is a great way to develop your leadership skills, learn more about trail and restoration work, and hone your "people" skills. . Send an email to guy@forestparkconservancy.org if you are interested in learning more about a volunteer opportunity.